"What on Earth? 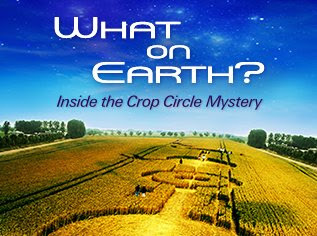 — Inside the Crop Circle Mystery" an award-winning feature-length documentary film, has just been released on DVD. A long time producer of events and projects having to do with our consciousness and our worldview, filmmaker Suzanne Taylor tracks her interactions, in England, over six summers, with an international community of visionary artists, scientists, philosophers, mathematicians, educators, writers, and farmers who marvel at crop circles. The superstars of the film are the circles, which remain an unexplained global phenomenon that has puzzled humanity for centuries — the photography is awe-inspiring. A question that’s addressed by the interviewees is why something so startling and spectacular is largely ignored. Circle enthusiasts, who converge in England every summer to go circle-chasing and indulge in circle analysis, talk about why they are so taken by this phenomenon. Evidence is presented that challenges the idea that all the glyphs are made by people, and the motives of hoaxers, who make some of the formations, is a subject for speculation. Interviewees also give viewpoints about who or what is delivering the formations that can’t be accounted for as coming from people, and why they are being created. “The most startling revelations we get from the circles come from their shapes,” says a character in the movie. “Mathematical information encoded in them delivers a virtual curriculum in number and geometry.” Also, the circles are looked at as art, as instigators to reexamine ancient knowledge lost to a culture that has become separated from nature, and as coming from a source that is aware of us and delivering patterns that point to events on Earth as well as in response to whims and wishes of individuals and groups. In the film, people speculate about what the effect would be if it were officially declared that the circles aren’t being made by people. “If that happened,” says Taylor, “it would get us thinking as one humanity in relation to ‘the other,’ which would be the best position from which to work cooperatively to solve the problems we all share.” Questions also are raised as to whether, if were we open to circle makers who come from elsewhere, they might offer advanced technologies to help us as we run out of resources and heat up the planet. The DVD of What on Earth? also contains outstanding bonus material. It includes commentary by researchers about their favorite circles; an alternative opening that delivers more information about the filmmaker; a moving eulogy about Pulitzer Prize winner, John Mack, a Harvard psychiatry professor who was enamored with the circles and is in the film; a music video of a crop circle song that’s in the soundtrack of the movie; and a gorgeous montage of circles. After a preview screening in February, at the UFO Conference in Laughlin, Nevada,What on Earth? garnered the award in the conference film track for best feature documentary. In April, the movie was the only film shown at the X-Conference, in the Washington, DC area. The X-Conference is an annual gathering to address the politics and implications of the UFO/ET issue: exopolitics. Taylor will take the film to England, in July, for a screening at the Glastonbury Symposium, a major crop circle conference that’s held yearly. It is the filmmaker’s hope that those in power turn their attention to the phenomenon to examine the available evidence. With our fingers in the dike to solve the pressing problems that challenge us on planet Earth, her hope is that the announcement of the reality of an ET engagement with us will shift the worldview that holds all our problems in place.
" What On Earth ? is an 81 minute feature documentary chronicling my interactions, in England, with members of the lively community of visionary artists, scientists, philosophers, geometers, educators and farmers who have been profoundly touched by the crop circle phenomenon. It deals with how our scientific materialistic worldview hampers serious investigation of a great mystery of our time, and how knowing the circles come from another intelligence would help us think as a planet to solve the problems that challenge us now. " We human beings are no accident; a fine-tuned construction allows our physicality to be. What mind designed us? And what accounts for artifacts produced long ago via technologies more advanced than our own? These mysteries are no greater, however, than what is occurring in present time, as an unseen presence is signaling us. It is making crop circles. All you have to do to be convinced that these impressions are being stamped into our reality from another one is to study these "events" that have been occurring for years in crop fields all over the world -- and in rice paddies, crab grass, iced-over rivers and more. Tracks from the likes of the Pyramids and Stonehenge have led to these formations, which are communicating in our languages of science, mathematics, art and philosophy, bespeaking a common source for us and them. The crop circles, to those with eyes to see, look like placeholders for the awareness that lies beyond the miracle of our self-consciousness. With our world at an ecological brink, and humanity in desperate need of vision for that next reality, would it not behoove us to investigate the possibilities inherent in modern-day mysteries to help us to see further? With the crop circles, it is possible that all we need is an appreciation for their extraordinary artistry, their technical wizardry, their inspired choice of canvases, to link with them in the very intelligence that created us both. "Our deepest fear is not that we are inadequate. Our deepest fear is that we are powerful beyond measure. It is our light, not our darkness that most frightens us. We ask ourselves, 'Who am I to be brilliant, gorgeous, talented, fabulous?' Actually, who are you not to be? You are a child of God. Your playing small does not serve the world. There is nothing enlightened about shrinking so that other people won't feel insecure around you. The Circle Makers could be trying to boost us to "the glory of God that is within us," in running their beautiful rings around us all. 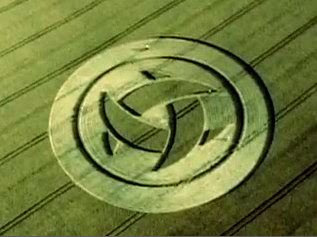 You can sign the Crop Circle Petition : "A Call For an Investigation of What is Known About Crop Circles" here !